Luckily, it appears I can still blog. 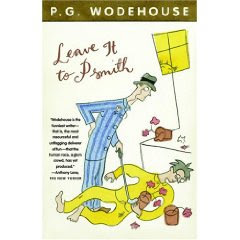 Seriously though, I have not read a book by P. G. Wodehouse that I did not like. Mostly, though, I've just read his Jeeves and Wooster stuff. I mean, I did read Mulliner Nights, too, and that one was great. So I decided to branch out. "Is Psmith (the P is silent) like Bertie Wooster?" Jacob wanted to know. Nnnnnooo... He IS a member of the Drones Club, but he also belongs to several other, more respectable, clubs in London. His driving motivation in this book is to find a job that is NOT in the fish business. So, yeah. He's job-hunting. That tells you how different he is from Bertie, right there. He is hilariously long-winded. Unbelieveably eloquent and silly at the same time. When trying to win the love of his heart's desire he belatedly adds that he can do card tricks. And recite Gunga Din. He spends the majority of the book impersonating someone else and doing a horrible job of it. Anyway, pick this one up if you need a laugh. And particularly if you like laughing at turn-of-the-century English people. Millions by Frank Cottrell Boyce. We listened to this one on the drive. I liked the narrator (VERY important for an audiobook) and I liked the story. Jacob and I laughed out loud fairly often. But the book is thought provoking as well. What would you do, really, if you had a million dollars? What if you had come by it in a very unlikely way? Mom, you should check this one out. Dragon Slippers by Jessica Day George. I had been meaning to read this one for quite a while. It was very cute. Tagline: She wanted dragon gold. She got a pair of slippers. So. It takes place in that fantasy time in which dragons are still around and used to be friends with humans, but aren't anymore. But Creel is going to change all of that. Maybe? She manages to be pretty sharp (but amazingly dense about the biggest most important thing in the book: the slippers) and her story is quite enjoyable. I'm glad I already own the sequel. 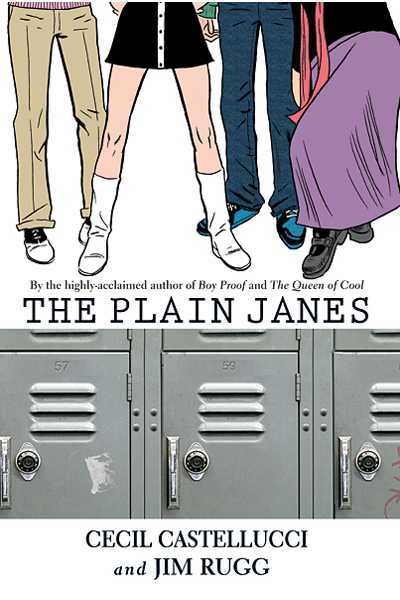 The Plain Janes by Cecil Castelucci & Jim Rugg. The Readergirlz pick for this month. This one is a graphic novel about Jane. She's recovering from tragedy and moving to a new town. Can she make friends and find herself? Can she change the world through art? I enjoyed the overarching themes of the book, and was entranced by the John Doe sub-plot, but had a bit of a hard time with some of their art attacks. I'm supposed to believe they had the money to buy the supplies for that? Without anyone knowing? mmm. Enjoyable read though. When I started to read City of Bones, I had no idea how intense the series was going to be. I read all three books in a matter of days because I couldn't put any of them down. There’s a part of me that wishes I would’ve read this series as each book was published, so I could wait and let the adrenaline coursing through my body ebb a bit. But, then there’s an even bigger part of me that’s glad I didn’t have to wait between each book as it would’ve been torture, even more so than waiting for Harry Potter and the Deathly Hallows or Breaking Dawn. The Mortal Instruments trilogy (consisting of City of Bones, City of Ashes, and City of Glass) is a young adult urban fantasy set in New York City. The Shadowhunters use runes to give them power to keep the world safe by defeating downworlders--non-humans or non-Shadowhunters. Mundanes, or humans, can't see Shadowhunters. However, one evening, Clary's thrown into the Shadowhunter world when she witnesses what she thinks is a murder. That same evening, she's attacked by a demon when she returns home to find that her mother has disappeared. She must enlist the help of Jace, a Shadowhunter who looks like an angel and acts a lot like a stuck up jerk, to find her mother. Each book was just as intense as the previous one. However, I think the stories became more intense as I went along because I knew the characters and I was more interested in what happened to them. The feelings the characters were going through along with the intense situations occurring around them made each book so action-packed that I felt like I needed an inhaler to help slow down my breathing and a sedative to relax my nerves. I’ve been trying to figure out a way to explain the intensity of this series to people who ask me what the books are about and this is what I’ve come up with. Imagine the frustration with the love triangle situation in Eclipse and add in the suspense and edge-of-your-seat feeling from the last three Harry Potter books, or even The Hunger Games. Unlike the Twilight Saga or Harry Potter, the books don’t deal with just one of those situations at a time; they deal with both intense situations throughout the entire series and it just escalates with each one! I was literally captivated by the story within the first chapter of each book. City of Glass is probably the best ending to a series I’ve ever read. The story or ending didn’t feel contrived. It didn’t feel like it was forced to go a particular way to meet the author’s expectations. The characters grew and they still acted like I expected them too. Most of the conflict was resolved, but some of it was left open for future possibilities. The ending wasn’t too fluffy or over-the-top, yet it left me feeling satisfied. I’m very pleased with how things turned out and I can’t wait to read the stories again in the future. Wow! It sounds intense! I've never needed an inhaler in my life, but I'll be ready when I pick these up, Jenni! Thanks for the review. Anybody else already read these?